June is celebrated widely as lesbian, gay, bisexual, transgender and queer (LGBTQ) pride month, a month dedicated to bringing the community together and celebrate their achievements, re-energising our efforts for future change. It is the act of a positive stance against discrimination and violence towards the LGBTQ community and works to promote positive self-affirmation for LGBTQ people, increase visibility and celebrate sexual diversity and gender expression. We know that when one identifies as LGBTQ, we often automatically become a target. From the bullies in schools, politicians who use LGBTQ people to gain political points or worse, those who go to violent extremes and cause physical harm, we understand that there are those out there who are filled with hate and intolerance and are willing to publicise it. We sometimes wear our fear on our sleeves, never ignoring that voice in the back of our minds asking “why?”. We all know someone who has been harassed or been a victim of violence or we’ve experienced it directly ourselves. But we must join together to deal with it. We must continue to work together to create safe spaces for us all – regardless of sexual identity – to exist. 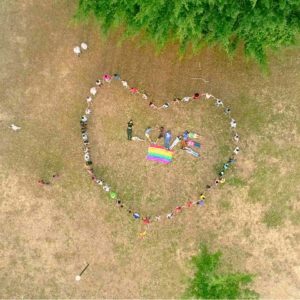 People often ask if Pride is still as important as it was in decades past, especially as historically, locally, the fight for LGBTQ rights has been an intense battle; our antiquated laws that criminalise homosexuality and a lack of documented policies for anti-discrimination on the basis of sexual orientation. The answer for us at SLF is absolutely and wholeheartedly YES; Pride is incredibly important. Pride is not just about drinking a ton at bars or parading through the streets to celebrate your existence; Pride is a celebration of progress toward LGBTQ equality, a celebration of our diversity and our uniqueness. The challenges that we face on a daily basis have allowed for human rights organisations, like SLF, to tirelessly tackle these issues in efforts to create a better, safer life for the youth. With the involvement of foreign diplomats and other like-minded non-governmental organisations (NGOs), the voice of the local LGBTQ community (and its allies) grows louder and louder and we must remain steadfast in our resolve to build on this upward momentum. 2017 was a landmark year for us at SLF. We led the LGBTQ arm of the Life in Leggings Women’s Rights March. 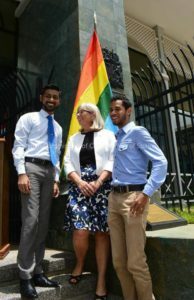 We partnered with the British High Commission to celebrate the International Day Against Homophobia, Biphobia and Transphobia (IDAHOBIT) to celebrate life and love. We were also directly linked to the hoisting of the rainbow flag with the Canadian Embassy that saw Canadian High Commissioner Carla Hogan Rufelds expressing Canada’s support of the advancement of LGBTI human rights. You don’t have to be LGBTQ to campaign for LGBTQ rights. Human rights are for everyone, regardless of who you are or who you love. There will come a day when bigotry and intolerance is history and we, at SLF, are committed to being an integral role in bringing that day closer. For now, we must continue to appreciate community and appreciate our diversity. Check out our Facebook page for more coverage of these and other events!